If you get the opportunity, definitely go dive the Orford Reef tank at the Oregon Coast Aquarium. Aside from being a unique SCUBA diving experience in Oregon, it is a lot of fun to wave at people who are inside the underwater tube. Some divers have friends visit the aquarium when they’re diving so they have someone to wave at in the tube and the person in the tube can take photos of them diving. This is an outstanding way to share your passion for and love of SCUBA diving with friends who don’t dive. The Orford Reef tank is the most challenging of the tanks at the Oregon Coast Aquarium to dive. Only very skilled divers are allowed to go in this tank. The tank is tight compared to the others. The biggest highlight for us is to wave at people on the other side of the glass. This tank used to be where Keiko the killer whale from Free Willie fame lived for several years before heading to Iceland. Now Keiko’s big tank has been broken up into several smaller tanks that each represent an ecosystem found off the Oregon coast. There are a lot of interesting fish in this tank. The water is so clear that it is very easy to watch the fish lazily go by. These tanks have divers in them at least once a week for cleaning so the marine life is used to seeing people on SCUBA. Newport, Oregon is right outside the door. When you schedule your diving experience at the Oregon Coast Aquarium, they will give you details on where to go and who to talk with so that you can get in the tank. The aquarium will tell you where to park. When we went, we parked in the normal parking lot although our friends who regularly dive the tanks as volunteer cleaners park elsewhere. The tank is divided into two parts by the big clear tube that runs across the middle. This is a tiny tank compared to what we are used to out in the open water. You can see the whole tank in a couple minutes but playing around waving at people in the tube can occupy at least a half hour. We used a ladder to get into the tank. There are never really waves or surge in this tank. It’s very benign. You can see all the way from one side of the tank to the other side of the tank. That’s about 30-40 feet. Water temperature is usually close to the temperature in Yaquina Bay. When we went diving, it was about 45F. It used to be that you could only dive the Orford Reef tank when a DUI Drysuit Days event was going on as a private individual. That usually happens once per year although we haven’t seen an announcement for an upcoming DUI event at the Oregon Coast Aquarium in a couple years. 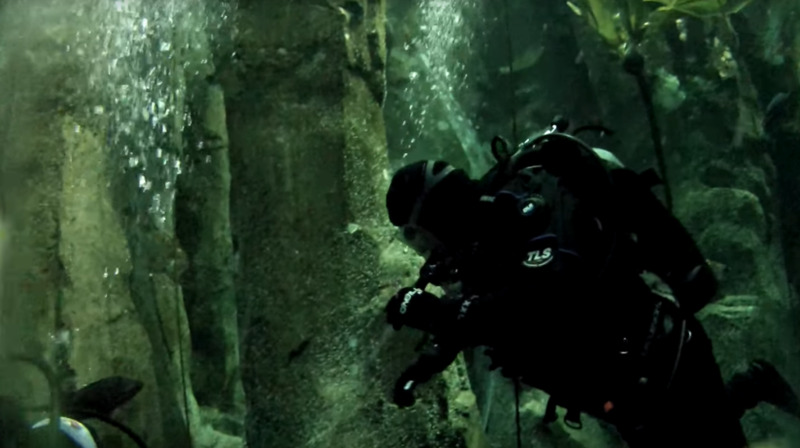 A Eugene-based shop now works with the aquarium to arrange private diving events in the tanks. We have not gone on one of these events but we did dive through one of the regional shops that used to participate in the DUI Drysuit Days events in the past. Note that they currently do not advertise being able to dive in the Orford Reef tank. 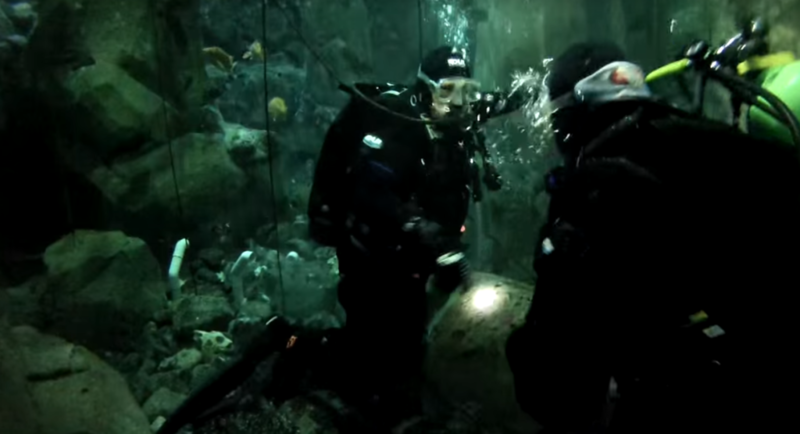 When we went with the DUI Drysuit Days program a few years ago, due to our extensive diving experience in Oregon and around the world, the aquarium staff and volunteers put us in the Orford Reef tank because the other tanks were full of people. Perhaps if you ask nicely, you can pay to dive Orford Reef. Otherwise, you can volunteer as a tank cleaning and maintenance diver. We know a couple people who do this and head out to Newport about once a month for a weekend of cleaning tanks. They both have been doing it for years so it must be fun! Our gauges read 25 feet at one point. Most of the time you’ll be between 10 and 20 feet. Open water divers can do this dive. However, we only got the chance to do this dive because we have extensive training in both recreational and scientific diving, and have thousands of dives under our weight belts in a wide range of conditions all around the world. We suggest that if you wish to pay for the opportunity to dive Orford Reef, you contact the aquarium or the dive shop running the program and see what training and experience you need to be permitted into Orford Reef. We think it’s worth the extra effort to dive this tank. The dive itself is straight forward and not that difficult if you are aware of your surroundings. However, we only had the opportunity to hop into this tank because of our extensive training and experience. There are overhead hazards associated with the clear tube that aquarium visitors walk through. The tank is also tight and requires finesse in navigating the close-together walls. If you are claustrophobic, you probably don’t want to hop in this tank. With three of us in the tank, there wasn’t much room. The aquarium was very serious about our neutral buoyancy skills and had us demonstrate them in the medical tank behind the Halibut Flats tank before letting us into Orford Reef. For these reasons, we rate this as an advanced skill level dive. The Orford Reef tank is a tight place to dive but it’s quite the fun experience. We had to walk about 100 feet from where we geared up, climbed some stairs to the top of the tank, and then descended a ladder into the tank. You need to be somewhat nimble to get into the tank and out again safely. Contact the aquarium and the dive shop that supports the aquarium to talk about diving Orford Reef. It is not normally a tank that divers who are not volunteers at the aquarium get to use. Be sure to have some friends at the aquarium to take photos of you from outside the tank. We took a small action video camera in the tank with us to take some videos which was fun to have. There isn’t much room to maneuver a big camera rig in here so we suggest not bringing anything bigger than a small action cam. There is a local dive shop in the South Beach area of Newport. When we went diving here, the aquarium supplied us with tanks and weights. We had to wash all of our gear before we could use it in the tank to make sure we didn’t transport any nasty creatures into the tanks. Both sides of the Yaquina Bay in Newport sport a variety of great restaurants. 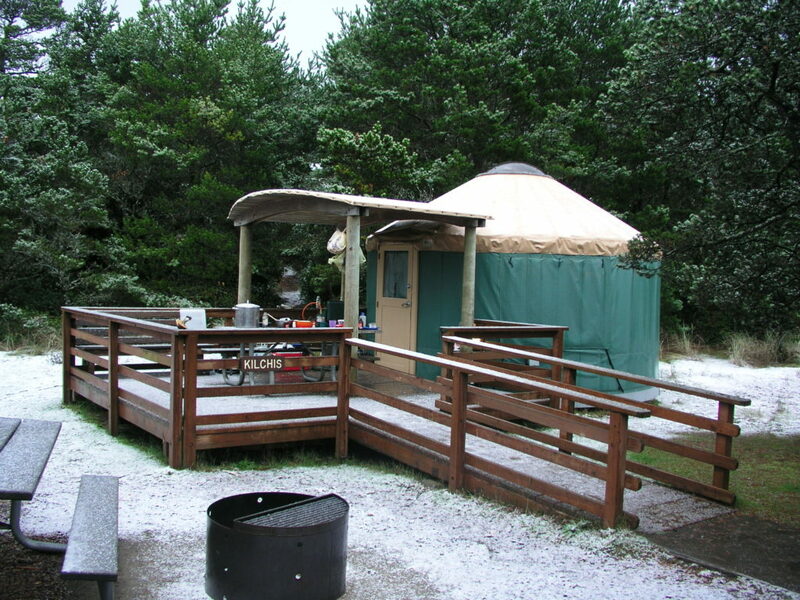 South Beach State Park has good camping and yurts for rent. We stay here when we’re in Newport. We have not tried any of the local hotels. Please let us know if you have and you can recommend one that is SCUBA diver friendly!